If you think that mobile apps are solely for big name brands, you are mistaken. More and more small and medium sized businesses are following the mobile trend and understand that an effective mobile marketing strategy should involve more than just a mobile friendly website. Don’t get us wrong a mobile friendly website, also known as a responsive website is an important part of a mobile strategy; now more than ever since Google’s latest algorithm update which is designed to penalise websites that are not optimised for mobile use. With UK adults estimated to spend an average of 2 hours, 26 minutes a day on mobile devices (eMarketer, April 2015), you would be foolish not to cater for them. 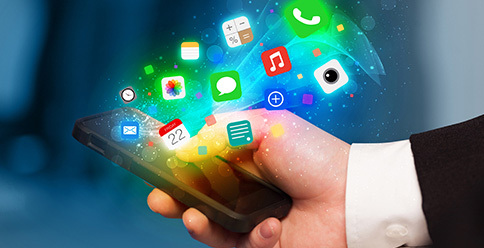 Let’s take a look at the seven reasons your business should have an app. Improve user experience with the combination of rich media and interactivity; simply and quickly. Mobile apps can display video content, play audio and incorporate interactivity to provide richer engagement for your customers. Mobile apps mean your customers are never more than a click away from your business. In today’s digital world, consumers want information and they want it immediately. From opening times to special offers, your app can tell your customers everything they want to know about your business. Use an app to integrate social networking and encourage Smartphone and tablet users to engage with you on Facebook, Twitter, Flickr and YouTube. Equally, social media is a great way of raising awareness and driving downloads of your app through both paid for and organic activities. Whether your mobile app is designed for iOS, Android or both it will appear in the iOS and Android marketplaces; iTunes and Google Play. This increases the visibility of your business and gives your business the potential to reach new customers, which potentially may not have found you. Developing a mobile app creates a direct marketing channel. In addition to providing your customers with the information they want, an app can remind customers about your products, services and special offers at predefined intervals via push notifications. Use your mobile app to create a digital version of your business’s loyalty scheme. By making it possible for your customers to collect their rewards via your mobile app could lead to an increase in app engagement, app downloads, word of mouth marketing and return customers. A mobile app can greatly contribute to your brand awareness, create an app that has features your customers will love and is well branded and beautifully designed. The more frequent your brand can get in front of potential customers, the more likely they are to become a customer, this is called “effective frequency”, as a rule of thumb, hearing or seeing a brand approximately 20 times will get you noticed.